Luc Jansen was born in 1959. 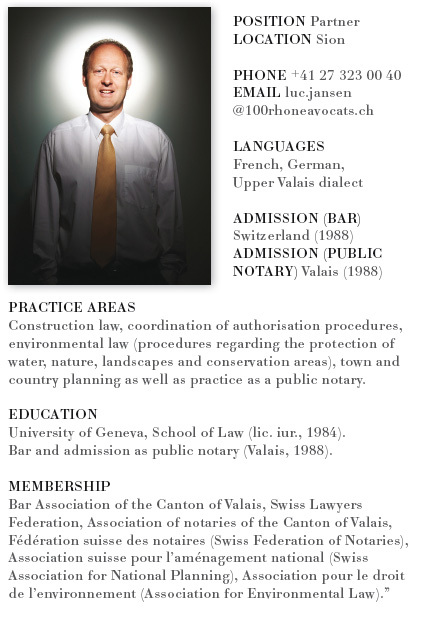 He graduated from the University of Geneva, School of Law (lic. jur.) in 1984. After having completed his training with a law firm in Sion, the Courts of Sion and with the Courts of the Canton of Valais, he was admitted to the bar as an attorney and simultaneously qualified as a public notary in 1988. From September 1989 onwards, he worked as a legal counsel for the Canton of Valais with the department of environment and town and country planning which then became the department of transport, development and environment. He presided over the Swiss military court n° 2 as a twenty-one yearlong member of the Swiss military justice system, with the rank of colonel. He joined the law firm 100 Rue du Rhône Avocats as a partner on January 1, 2013 for the office in Sion, Valais, after twenty-three years of practice in public and administrative law, particularly in the area of environmental law. He has written and published several specialised articles, including the recent Schulthess commentary of federal laws concerning water protection and river management of which he is co-editor and co-author. Luc Jansen works in French and in German. He also masters the Upper Valais dialect.